I’m relatively new to the sport of boxing when it comes to both active participation as well as true fandom. The nuances of the sport still fascinate me as they appear to be something that can never be perfected. No two fighters are the same just as no two fights are the same. However, my goal is not to wax poetic about how big Mikey Garcia’s heart is or discuss his perilous attempt to move up and defeat arguably the best 147 pounder on earth (Bud Crawford fans please remain calm). What stood out most while sitting a mere 10 feet from Manny Pacquiao and Floyd Mayweather at AT&T Stadium certainly wasn’t watching Jerry Jones parade around his publicly subsidized stadium like a puppy delivering a stick to his owner. Nor was it seeing all time fan favorite, Deontay Wilder, step over the ropes and into the ring before the fight to establish his presence. But rather, the passion that each of the forty-five thousand screaming fans showed for their respective fighter was most palpable. I’ve always felt strongly that sports represent so much more than just mere entertainment. When us regular people watch sports of course it’s fun to see Steph Curry shoot 40 footers or OBJ catch touchdown passes while doing back flips. But what really draws fans in is their emotional attachment to their team and player. The “Your Team vs. My Team” mentality that feels almost inclusive of the viewer. Whether it’s Derrick in accounting who gave up baseball after 7th grade because his fastball never hit 40mph or James who had to retire from basketball during high school because he got dunked on by his rival high school and the video went viral, everyone feels an attachment to their team which is what creates emotion as a fan. What really became clear to me for the first time in that stadium, before, during and after the fight, was the genuine pride these fans took in watching their fighters compete. Unlike any other major sport, boxing is competition in its rawest form. When you’re in the ring, you are vulnerable and you are at risk. You are completely and totally isolated with no other option than to fight back. So, when I could quite literally feel the emotions of the Garcia fans as their man was knocked all over the ring, I got a remarkable insight into a sport I’m still learning so much about. Everyone in Dallas took a side and supported a fighter and the success of that fighter, for 12 rounds, somehow seemed to represent their own success. The ringside Spence fans, rightfully so, gallivanted around with an “I told you so” mentality almost as if they were also the ones in the ring fighting. Meanwhile, the Garcia fans were notably deflated and I, like the rest of them, walked away feeling like we too had been punched in the face. No one other than friends and family had any real vested interest in the outcome (other than me, who lost my rent money betting Mikey Garcia at +385) but that made no difference. In a sport where your talent and balls (for lack of a better word) often determine the outcome of your fight, it was so fantastically eye opening to see how intimately every fan felt toward their fighter. I asked a gentleman next to me for a pre-fight assessment and immediately, despite having no relationship with either contestant, you could see the passion in his eyes when he started explaining to me why EJ’s jab was going to be too much for Mikey (he was right). 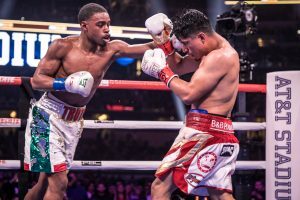 He started throwing his right hand out in the appropriate southpaw stance, emulating Spence’s style while taking pride in his own skills almost as if he were about to get in the ring. Or the lady next to me with the “Team Mikey Garcia” headband starting to tear up after the first few rounds when it became obvious that her fighter likely wasn’t going to get the victory. Even the next day back at my hotel, the feelings of respective elation or deflation were obvious with both sides still showing the effects of their fighter’s outcome. Boxing is a remarkable sport. Men and women of different sizes, socioeconomic backgrounds, origins and colors all risking everything every single time they compete. But what’s truly unique about the sport’s fan base is that we all feel like we are in this together. Half the stadium won last Saturday and half the stadium lost. Despite the individuality of the sport, the outcome was anything but.